The CKEditor 5 architecture was designed and rewritten from scratch to bring the collaborative editing features where multiple authors work on the same rich-text document. Collaboration is provided by three easy-to-integrate plugins delivering different features. The comments feature lets the users add sidenotes to marked fragments of the document, including text and block elements such as images. It also allows the users to discuss in threads and resolve comments when they finish the discussion. The comments feature lets you define where you want to store the discussion by creating a simple adapter. If you want to have the comments discussion to be synchronized automatically between users, you can also use comments as a part of the real-time collaboration. Refer to the Comments overview for more information. The track changes feature brings automatic suggestion marking for the document as you change it. When editing the document, the user is able to switch to the track changes mode. All their changes will then create suggestions that can be accepted or discarded. Refer to the Track changes guide for more information. Real-time collaboration is a complex feature that is available for CKEditor 5 thanks to its modern architecture. It lets multiple users simultaneously work on the same document — even on the same part of it, with no content locking. This feature allows you to enable comments and track changes features in the real-time collaboration mode where they will be synchronized automatically between users. 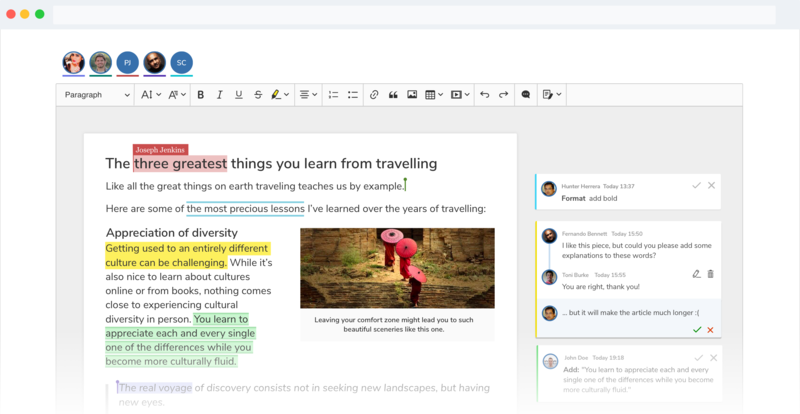 Thanks to this collaborating users will not only be able to edit a rich-text document at the same time but also discuss in comments. Real-time collaboration comes with a ready-to-use back-end which can be used as a SaaS solution with CKEditor Cloud Services or installed on your machines (on-premises). Refer to the Real-time collaboration overview for more information.